Click here to access the cartoon and read the backstory. 1. Refer someone to our inn. Just put your name on our business card or brochure, hand it to a friend or acquaintance who has never stayed at Hidden Meadow Inn before, and ask them to give it to us when they arrive. Or they can give us your name when they book their reservation on the phone or on our online reservation request form. For every party who stays with us because you referred them to our B&B, we will give you a 20% discount on the cost of a room the next time you come. Let us know if you need more business cards or brochures. 2. Write online reviews of our inn. We will give you a one-time discount of 5% for each review you write on a unique site (up to 40%). Please email us at youarewelcome@hiddenmeadowinn.com when you post a review telling us where and when you posted it. We’ll keep track of it for you so we can credit you with the appropriate discount on your next visit. BedandBreakfast.com Click on “Write a Review” Posting a review takes only a minute, and you could win a $1000 BedandBreakfast.com Gift Card! 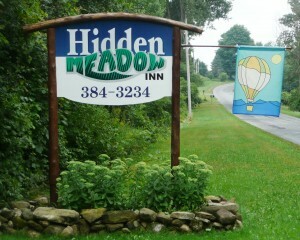 Hidden Meadow is one of the very few Bed and Breakfast Inn’s that truly make you feel like you are in your own home. Hosts, Bill and Joanna are delightful and have provided a warm and welcoming place to really get away from it all. Breakfast was fantastic, the rooms were great and we can’t wait to come back again. Thanks again for your fantastic hospitality. Free telephone calling in the U.S.